This cartoon is simply a straight drawing of David Cameron and George Osborne, based on photographs of them from Private Eye. 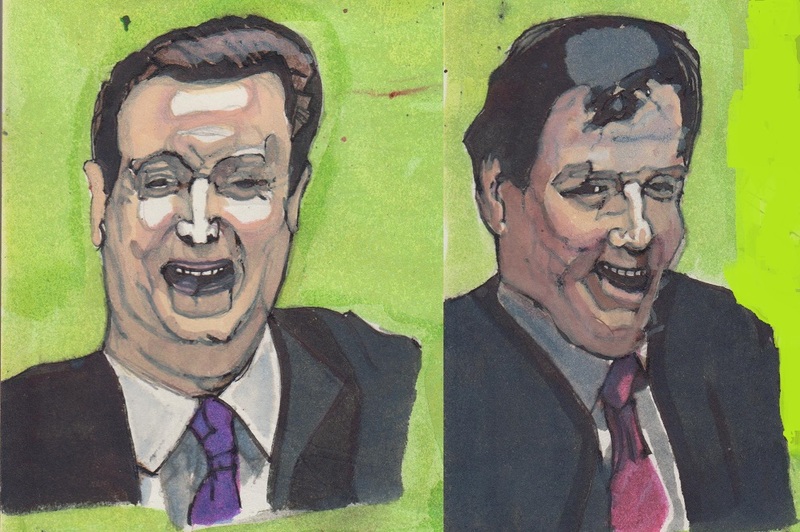 These showed them laughing like a malignant, old Etonian Nazi version of the Chuckle Brothers. Of course, the Tories enjoy a good laugh mocking the Labour party, or anybody else in parliament who dares to tell the truth about the mass poverty they’re inflicting for the profit of big business. Remember the way May laughed robotically shortly before the election, when Jeremy Corbyn dared to remind her of it? But it’s also not hard to imagine that they are laughing, not simply as a way of trying to shrug off the entire accurate attacks on them and their vile policies, but also at the poor and the very people, who are suffering through their policies. Mike put up a picture a year or so ago of Cameron and Ian Duncan Smith, the minister in charge of culling the disabled, having a real belly laugh in parliament at a speech, in which the sufferings of one disabled woman due to their welfare reforms, were being read out and described. If you want a graphic demonstration of the Tories’ real attitude to the poorm that was it. The Tories are dismantling what’s left of the welfare state and privatising the NHS, all for the benefit of the rich and big business. They have seen their tax rates cut, while the tax burden has increasingly shifted to the poor and working class through the imposition of indirect taxes. This has been a direct consequence of nearly forty years of Thatcherism. Left-wing economists, politicians, and writers have said that it is the largest redistribution of wealth upwards for decades. The result has been massive wealth for the few, while the 75 per cent of the population who aren’t rich have been thrust further into poverty. Over a hundred thousand people are forced to use food banks. Seven million people live in food insecure households, just about feeding themselves today, but unsure whether they’ll have enough tomorrow. Wages are stagnant and below the rate of the inflation. The disabled and unemployed are thrown off benefit at the whim of jobcentre clerks and decision makers. Many of those fortunate enough to have jobs are stuck in short-term, part-time or zero hours contracts. Insecure short-term work, which does not pay enough to support them or their families. The majority of people claiming benefits aren’t the unemployed, but people in work hit by this type of poverty. And the Tories are hitting the working poor as well. If you’re low paid and need benefits, it’s your fault for not being able to get a better job, rather than due to structural faults in the economy and decades of Thatcherite employment policies. So they’re busy trying to find ways of sanctioning these poor souls as well. This is all done in the name of creating a fluid jobs market, enabling employers to hire and fire workers at will, and not having to pay those workers they do retain if they don’t need them that day. This is supposed to create employment. But the Tories aren’t interested in creating mass employment. 19th century free trade economists and their monetarist successors wanted to keep a certain proportion of the population – about 8 per cent – unemployed in order to use the threat of unemployment to keep the working class in line and wages low. This has made the rich much richer. And some of the Tories were very frank about what it meant at the time. Private Eye, reviewing one of the ‘heritage’ books that came out during Thatcher’s period in office about the wonderful lives and stately homes of the aristocracy, quoted Hugh Massingberd’s comments about it in the Times. After decades of attack by Labour governments, who had imposed death duties on them to break up their wealth, the aristocracy were returning to their old power and status. It was, he declared, ‘a social restoration’. The anonymous reviewer pointed out what this meant for the rest of us. The rich were winning back their old seats in society, and the rest of us were going to be sat on. Meanwhile, the Tories have sought to maintain their grip on power through lie after lie. They claim that only they represent the real working class, defending hardworking people against idle scroungers like the unemployed and asylum seekers. The NHS is being privatised and cut to the bone, but they then claim with a straight face that in real terms, there’s more money being spent on it than ever before. They aren’t depriving people of benefits, only reforming it so that it goes to the people, who deserve. Yeah, it’s because these reforms are so accurate that we have so many people dying of starvation. As for food banks, people are only using them because it’s free food. It’s another lie. You can only use them if you have a chit from the jobcentre to say you have no money and can’t feed yourself. But the truth is irrelevant to Tories mouthing this nonsense, like Edwina Currie. And at the top you get the sneers and condescension from very rich Tories, who are doing very well, thank you very much. Johnny Void, Mike and the Angry Yorkshireman at Another Angry Voice carried a sample of some of these a few years ago. One Tory patrician declared that the homeless were ‘the people you step over coming out of the opera’. And Matthew Freud, who was briefly a member of Blair’s New Labour before jumping ship and joining the Tories, declared that the poor should be more flexible than the rich, as they had less to lose. These people are out of touch, and are sneering at the victim of the poverty they have imposed. After the elections in the early 1990s, which saw John Major enter downing street as the new Tory pm, Spitting Image ran a series of sketches. These showed the Tories turning up outside the homes of ordinary people and asking them if they vote for them. When they said ‘Yes’, Major and his cabinet chanted ‘Stupid, Stupid’ at them. This was because the British public had voted them back in, despite massive poverty due to cuts and a housing crisis that had created a rise in homelessness as people had their homes repossessed for not being able to repay their mortgages. Just as the lack of affordable housing now means that the majority of working people will be unable to afford their own home, and rents are also high. So behind the carefully crafted veneer of ‘one nation’, ‘compassionate’ Conservatism – which is in fact anything but – it’s not hard to see that the Tories are having a laugh at the British public, sneering at the ordinary people, who elect them sincerely believing that they mean to serve them. They don’t serve us, and have nothing in common with us, despite all that bilge about how ‘we’re all in it together’. They serve only the rich, and despise and hate the working and lower middle classes. But for a genuine politicians, who does have the interests of the poor at heart, vote Labour and get Corbyn into office when ‘strong and stable’ May’s administration finally collapses. How do you tell when a politician’s lying? His lips move. – old joke, dating from at least the 1980s. I first heard the above one liner on the Max Headroom Show in the 1980s. And May’s appearance on Question Time bore out the great computer-generated compere’s witticism, if only in that it applied to her. I didn’t watch the show – I know, it’s terrible for a political blog like Mine – but I knew it would annoy me. But I did catch a bit, where one young woman took May up on her party’s funding of the NHS. She stated that the Tories had cut NHS funding, and that we have the lowest level of funding of any nation for our health service. May denied this. She stated that the Tories have made more funding in real terms than every before, and that it was untrue that Britain provides less money that all other nations to its health service. The first is a lie, the second a half-truth. May’s government has undeniably cut funding. They’ve been saying throughout that they intend to make millions of pounds worth of savings from cuts to the Health Service. She has somewhat ameliorated this by claiming that the Tories are now going to provide an extra £7 million for the NHS. But this is till much lower than the millions they intend to cut from its budget, so that funding will still be cut. There’s nothing new about May’s statement. The Tories lie as easily as most people draw breath. It’s instinctive. And this kind of mendacity goes all the way back to Thatcher, if not before. I can remember how Thatcher was cutting funding to the NHS, but, when questioned on this, she replied that they were giving more money in real terms than ever before. She also stated that the NHS would be ‘safe with us’, at the same time she was discussing its privatisation with Geoffrey Howe. As for the Britain spending less on its health service than other countries, I’m sure there are many other nations that do spend less on healthcare. But for a very long time Britain has spent less on its health service than other, developed western countries. May is lying about giving money to the NHS. She is actively cutting it, prior to its privatisation. Don’t believe her Thatcherite lies. Save the NHS, and vote for Corbyn on June 8th. Theresa May was missing from the leader debate broadcast on BBC 1 last night. The leaders of all the other parties were there, except for her, and her place was taken by the Home Secretary, Amber Rudd. May’s absence was no surprise to anyone. She’d already said many times before that she wouldn’t be appearing in the debates, and keeps dodging challenges by Corbyn and other party leaders to meet them in open debate. It’s a tacit admission that rather than being ‘strong and stable’, May is weak and wobbly, who can’t face being challenged on her terrible policies and manifest failures by her political opponents in an arena she can’t control. When she goes out to meet the public, it’s in very controlled circumstances like the extremely stage-managed PR exercises used by Blair and New Labour to give their administration a popular veneer. The meetings are held on private premises, and are frequently invitation only. Authentic proles are not invited. When the proles do get near her, as they did in Bristol, when she emerged from one of these private meetings, they see her off with boos and jeers. She is manifestly not a ‘woman of the people’. And the media and public are asking questions about her whereabouts. Boris Johnson was on Breakfast TV a moment ago. The presenters asked him where May was. He huffed and puffed in his usual, blustering manner, but admitted that he didn’t know where she was. He tried to make this sound better by saying something to the effect that wherever, she was, she was doing a good job. Which sounds to me like another line from one of the great comedians of the 1990s, Harry Enfield. I’ve mentioned in a previous blog post how Amber Rudd’s speech last night sounded like a Rory Bremner impression of Michael Howard. Rudd, in her concluding speech, stated that a vote for any other party than the Tories would be a vote for Labour. This sounds like a joke Bremner made about the threadbare nature of the Tory arguments when Howard was leader of the party. In one sketch, Bremner appeared as the-then Tory leader, and said into the camera, ‘If you don’t vote Tory, Labour will get in.’ That was his whole argument in the satirical sketch, and pretty much the only arguments the Tories could muster at this time. Just as it appeared to be the core of their argument last night, only with the slight addition of rubbish about the ‘coalition of chaos’, Brexit and how May was ‘strong’. As Johnson showed just now, this is very much the kind of answer the Tories give when they don’t have an answer – they automatically try to shift the blame on the failings of the last Labour government. As the Tories lose their lead in the polls, they’re floundering about using all their tired clichés to cling to some semblance of the popularity. And just as celebrities as they aged started to look more like their Spitting Image puppets, so the Tories are becoming increasingly indistinguishable from the jokes and caricatures about them. They have no answers, and offer nothing except more poverty, despair and the victimisation of real working people, the elderly, the sick and disabled. All for the benefit of the rich upper 25 per cent. Is Trump Barely Able to Read? My thanks to Joanna, one of the long-time commenters on this blog, for posting this in one of her comments. In this piece from the David Pakman Show, Pakman and one of his producers, Pat, discuss the considerable evidence that Trump is functionally barely literate. There are clips of Mark Fisher, an American journalist, discussing how he asked Trump if he was preparing for the presidency by reading the biographies of the great American presidents. Trump said something about reading one about Nixon, and another, but Fisher himself doubted he had ever read a book from cover to cover. Trump also said that he had never read a biography, but regretted this. Visitors to Trump have remarked that there weren’t any books on his desk, or on the shelves at his home or indeed anywhere else. Jeffrey Schwartz, who ghost-wrote Trump’s book, The Art of the Deal, stated that he didn’t believe Trump had ever read a book since he was in school. Washington insiders have said that The Donald actually has difficulty reading the documents and executive orders placed in front of him. He usually just scans the first page. Further evidence for this comes from clips from a court case, in which the opposition lawyer asks Drumpf to read a lease. Trump’s own lawyer objects to it, and Trump looks it over, remarks on its length, and then proceeds to give a summary of what’s on the page. Apparently, he doesn’t even send his tweets himself. He dictates them to a secretary in the next room, and she sends them for him. There’s also a clip with the writers from the comedy show, Saturday Night Live, in which they talk about how Trump had difficulty reading the scripts when he was guest host. And it’s also been said that the reason why Trump watches so much television, and gets so much of his information from it, is because he can’t or doesn’t read books and papers. There’s also a clip, which shows Trump very obviously not using a teleprompter at one of his rallies. Pakman argues that this isn’t because he’s particularly keen to speak ad lib. It’s because he has difficulty reading what’s on there. Pakman’s producer, Pat, finally makes the point here that what’s shocking isn’t Trump’s inability to read, but his lack of intellectual curiosity. He doesn’t even send away for talking books, so he can hear things read to him. This is truly astonishing. And frightening. People have been making jokes since forever and a day about the stupidity of politicians, but many have been people of real intellectual distinction. Churchill wrote his History of the English-Speaking Peoples. JFK apparently could write a sentence of Latin with one hand while writing a sentence in Greek with the other. Even Nixon was no intellectual slouch. He was crooked and a monstrous imperialist thug, whose regime was responsible for the deaths of untold millions in the Vietnam War and Fascist coups across the world, and he really wasn’t intellectually capable of being president. But he wasn’t thick either. Bill Clinton was far from stupid, though he was also responsible for some of the worst policies passed by an American president, such as gutting further what remained of the American welfare system after Reagan, quite apart from highly questionable foreign policy decisions. On the other hand, there are a long line of chiefly Republican presidents, who have been suspected of being thick and incompetent. Like Ronald Reagan, even before the poor fellow was diagnosed with Alzheimer’s. Not The Nine O’clock News sang songs about his epic stupidity. There was a long-running sketch on Spitting Image, in which his aides go in search of his missing brain. Then in the early part of this century, he was followed into the Oval Office by George Dubya, who had been an illiterate drunk smashed out of his skull on recreational chemicals. Dubya at least gave up the booze and drugs, and was credited as reading. He still struck everyone as being so stupid, that when one person made up the rumour that he only had an IQ of 85, it was widely believed. And at one point it looked like America would get a female vice-president in the shape of Sarah Palin, who has a reputation for monumental stupidity. One American commenter described his candidacy for the presidency or vice-presidency to a ‘post turtle’. What’s a post turtle? He explained that if you go to the Deep South, ever so often on the roads you see a turtle stuck on a fence post. The turtle’s got no right to be there, doesn’t know how it got there, and you don’t know what moron put it there. And that summed up Palin’s bid for supreme power. And now we have Donald Trump, a sexist, misogynist, islamophobic Fascist, a narcissistic megalomaniac, who seems unable to read or comprehend the documents put in front of him. He is massively unfit for office, and the fact that he’s in it points to a deeply troubling strand of anti-intellectualism in the Republican Party. The late comedian Bill Hicks used to joke that there was a streak of anti-intellectualism in America, and that it began the same year Reagan was elected. He had a point. Reagan got into power by presenting the image of a down-home ordinary bloke, offering his folksy wisdom in place of the complicated and simply wrong ideas offered by those affecting to be cleverer than the rest of us. And this is a powerfully attractive approach. No-one likes the feeling that they’re being condescended to by someone impressed with their own intelligence, or being treated with contempt. And the right, both in America and in Britain, try to capitalise on this anti-intellectualism. You think of all the times the Tories have tried to persuade the public that you don’t need to know about fancy economic theories to understand the economy, just commonsense household management. Left-wing economists have tried to point out that, in fact, you do need to understand economics as it is definitely not like balancing a household budget. But still they carry on, using the metaphor of household budgeting to justifying cutting services and privatising the NHS. And now Trump, who appears to be barely literate, is in the White House. Pakman points out that it seems that Trump spoke at the level of a fourth grade schoolboy, not because he was trying to talk to ordinary Americans at their level, but because his reading level is that of a fourth grade schoolboy. It’s been said that politician is the one job that doesn’t require qualifications. Well, intelligence doesn’t guarantee that someone will make the right decisions. But in a complex world, in which power relationships between countries are so delicate that a misstep could start an international incident or even another war, we do need intellectual ability in our leaders and their advisers. We need politicos, who have the ability to obtain the knowledge of world affairs they need, not just from the broadcast news, but from foreign policy documents, even simply from reading the papers. Trump seems incapable of this, and it puts us all in danger. He really does need to go. Mike today put up a piece, which asked rhetorically how we should receive Tony Blair’s statement that he is setting up a new institute to promote centre-ground policies. Blair, apparently, is concerned about the resurgence of left- and right-wing populism. The new institute will be launched in the New Year, but will not be party political. Mike in his comment to the story makes the point that Blair is a creature of the reactionary right. Margaret Thatcher, who began the decades-long destruction of this country, its institutions and industries, and the impoverishment and immiseration of its working people, considered Blair and New Labour her greatest achievement. And when Cameron came to power, he began by consciously modelling himself on Tony Blair’s mixture of neoliberalism and social reform. Mike comments that the best reaction to the news is probably that put out on Twitter by Matt Turner. This shows Jeremy Corbyn having a dam’ good laugh. Actually, you could go a bit further than Mike in the characterisation of Tony Blair. He is indeed a creature of the reactionary Right. He is also a crook of almost Reaganite dimensions. Reagan, remember, implemented Thatcher’s policies in America as a reaction to the liberalism of the 1960s. He was a thug who supported right-wing Fascist death squads all over south and central America, who committed appalling atrocities in order to keep the peoples of that continent in thrall to their upper classes and American corporate and political interests. Just as Tony Blair fully and heartily cooperated with Bush in launching an illegal invasion of Iraq, an invasion that has similarly seen the rise of death squads armed and supported by our allies in Washington. Reagan and Blair also deregulated the financial sector. In Reagan’s case, this was the savings and loans societies – the American equivalent of our building societies. And the results were identical. Massive greed and mismanaged by the financial whizzkids resulted in financial crashes in which some of the very poorest lost their money. This included the cowboys, the remaining agricultural workers on America’s ranches, who Reagan’s supporter, Clint Eastwood, claimed symbolised sturdy Republican values – self-reliance, and having a piece of land of your own. Thanks to Reagan in America, millions of Americans had the opportunity to own a piece of property of their own taken away from them. Just as, decades later, Tony Blair did it to the working people over here. And then there’s the whole process of the mass privatisation of industry. Reagan started that off, along with the attacks on the American welfare system, using arguments that were also repeated over here by the Blairites in the Labour party. He also flagrantly violated the American Constitution with the Iran-Contra affair, although he managed to escape and it was Oliver North who ended up going to the slammer. Blair’s backing of the Iraq invasion was similarly illegal, but under international law, as our country doesn’t have a written constitution like the US. He was also responsible for some of the policies that are chipping away at our liberties as free citizens. Like Major, Blair was a fan of the surveillance state, wishing to introduce mandatory identity cards, for which we, the ordinary citizens, would have to pay for the privilege of having. He also wanted to expand the powers of the surveillance state and introduce secret courts. These have also been taken over by the Tories and Lib Dems. Blair was also a liar, in that his government was determined to privatise the NHS, but like Thatcher, knew that actually telling people they were doing so would lose them the election. And so, like the Tories before and afterwards, he carefully hid what he was doing. And then there’s the man’s personal character. He and his wife, Cherie, were massively greedy. They took money from businessmen in a series of sleaze scandals of the type that disgraced John Major’s administration. Corporate donors were given favours and places on government committees and quangos. Cherie Blair, who tried to pass herself off as a human rights lawyer, was quite prepared to work for some of the most brutal and reactionary nations and dictators the world over, if the money was right. And what kind of left-winger, never mind Socialist, spends his holidays enjoying the hospitality of Berlusconi, whose ruling right-wing coalition included the post-Fascist Alleanza Nazionale, and the Northern League. The latter were so right-wing, they despised the Italian south as foreigners, sneeringly referring to it as ‘Egypt’. Their dream was an independent state in the north of Italy. And the core of their supporters were Fascists. There’s a documentary on YouTube by an Italian journalist, who went in search of the Northern League in his home country. He found them, and they’re very scary. They were, as you’d expect, militantly anti-immigrant. And there’s one scene where he filmed them in a café singing the old Fascist squadristi songs, and reminiscing about the old days under Il Duce. The documentary’s in English, so there’s no problem for Anglophone viewers seeing for themselves how unpleasant these rightists were. And Blair’s greed was so much that the Italians nicknamed him ‘the scrounger’. He then followed this up a year or so ago, by being George Dubya’s guest at a Republican Convention, though he wouldn’t say whether or not he was a Republican. As for being aghast at the rise of populism on both right and left, Blair’s neoliberalism, his attacks on the welfare state and wars in the Middle East are directly responsible for this. His destruction of Iraq, which subsequent regimes have expanded into Syria and Libya, have displaced millions, who can see no future in their home countries. Hence they try to get into western Europe, where they believe they will have safety, jobs and prosperity. At the same time, Blair attacked the welfare state over here, as well as trying to destroy the unions further, and reduced employment rights and working conditions. The result is that millions of Brits are now plunged in precarity, making a meagre living from insecure, low-paid, and often temporary jobs, and saddled with debt. Their scared, and resentful of a corporatist elite, which only offered sanctimonious platitudes about civil rights and racial and gender equality, while making living conditions for ordinary people much worse. And people frightened for their jobs, and acutely afraid that they are being denied welfare payments, are going to be resentful of the immigrants they fear may take those things away from them. Hence the massive xenophobia that has spread alarmingly across Britain in the wake of Brexit. Blair’s responsible for all that. But he stupidly believes that the answer to this fear and poverty is going to be, well, more of what he stood for: more neoliberalism, more rationed welfare services, more privatised healthcare, more tax cuts for the obscenely right. But somehow made palatable by mellifluous verbiage and lies about increasing opportunity, personal choice, and greater opportunities for women and minorities. But working people, women and minorities ain’t buying it. There’s an long article in Counterpunch by two of their female columnists discussing why a very large number of American women voted for Trump against Hillary. This was even after it had become abundantly clear that The Donald was a boorish misogynist, who had no qualms about sexual assault. These two women, who both were staunch feminists, made the point that American women were largely unimpressed with Killary’s claim that they should vote for her, because it was about time a woman was in the White House. This didn’t impress the female electorate, who reasoned that Killary’s victory would not be a triumph for all women, but only entitled, rich women. Ordinary, middle class and blue collar women, were still faced with the fear of keeping their jobs and providing for their families in an economic regime in which they could be laid off and their jobs moved halfway around the world. They were faced with the harsh realities of paying the bills and finding affordable medical care when wages hadn’t risen in decades. The two authors made the point that the kind liberalism promoted by Clinton’s establishment Democrats, and Tony Blair and his ilk in Britain, doesn’t actually care about looking after the poor. They care about making sure a fair proportion of those enjoying the top jobs and position are women and members of ethnic minorities, while doing their level best to make sure the majority of people remain in poverty and insecurity for the benefit of the corporate elite. The reason why Trump and Farage are on the rise on the Right, and Bernie Sanders and Jeremy Corbyn on the Left, is for the simple reason that ordinary people have got sick and tired of the lies uttered by people like Blair and the Clintons, that provide an egalitarian cloak for a harshly unequal and exploitative system. The same thing’s now happened to Blair. He can get used to the fact that he is now politically irrelevant, if not actually a liability. So let’s treat him like one, and give his institute the derision it deserves. Okay, in my last piece I put up a section from Maggie Thatcher’s own book, The Downing Street Years, showing that her ‘Victorian values’ meant that principle of less eligibility, under which people have been thrown onto the street and left to starve and take their own lives in order to stop them becoming dependant on welfare. Many people recognised this at the time. It even formed the basis for some of the satire in the 1990s puppet TV show, Spitting Image, which regularly lampooned the Leaderene, along the Royal Family, the president of the US, and just about everyone else amongst the Great and the Good. 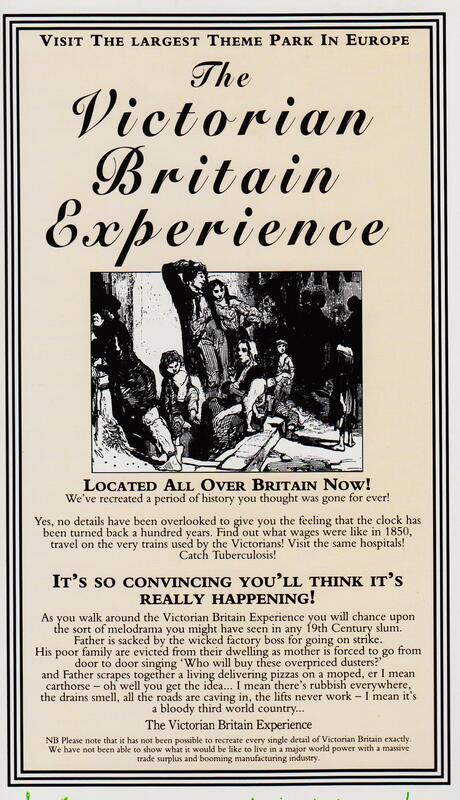 I found this mickey take of Thatcher’s Victorian values, presented as a spoof ad for the Victorian Britain Theme Park, in the Spitting Image book, Thatcha! The Real Maggie Memoirs (London: Mandarin Paperbacks 1993). Visit the largest theme park in Europe. Located all over Britain now! We’ve recreated a period of history you thought was gone for ever! Yes, no details have been overlooked to give you the feeling that the clock has been turned back a hundred years. Find out what wages were like in 1850, travel on the very trains used by the Victorians! Visit the same hospitals! Catch tuberculosis! It’s so convincing you’ll think it’s really happening! As you walk around the Victorian Britain Experience you will chance upon the sort of melodrama you might have seen in any 19th Century slum. Father is sacked by the wicked factory boss for going on strike. His poor family are evicted from their dwelling as mother is forced to go from door to door singing ‘Who will buy these overpriced dusters?’ and father scrapes together a living delivering pizzas on a moped, er I mean carthorse – oh well you get the idea … I mean there’s rubbish everywhere, the drains smell, all the roads are caving in, the lifts never work – I mean it’s a bloody third world country. NB Please note that it has not been possible to recreate every single detail of Victorian Britain exactly. We have not been able to show what it would be like to live in a major world power with a massive trade surplus and booming manufacturing industry. It’s as accurate a depiction of post-Thatcherite Britain as it was when it was written, to take the mick out of Thatcher’s own squalid little tome. As for Britain becoming a third world country, this is what the Thatcherite authors of Britannia Unchained want – for Britons to work the same long hours for low pay as the peoples in the Developing World. All while they get rich, of course. These are a couple of videos from ITV’s satirical puppet show, Newzoids. The show’s a mixture of puppetry and CGI animation. It was billed as the 21st century’s successor to the classic Spitting Image. They were seriously considering bringing that series back, but the idea was dropped because the series would simply have been too expensive given inflation, lower production expenditure and advertising revenue, and stricter health and safety legislation. For the latter, Fluck and Law, the creators of the puppets used in the series, expressed amazement at the relative disregard they had for proper safety standards when they were using highly toxic and flammable materials. The puppets used in Newzoids are rather different to those in Spitting Image. They’re less complex, rubber hand puppets and more like solid, wooden figurines moved by sticks. Or at least, that’s the image the animation gives. The satire, though, is still very sharp. In this sketch, Nigel Farage is shown as a Bernard Manning-style stand up club comedian, railing and sneering about immigrants. The crowd heckles him, reminding him of how false and hypocritical his claims are, and that he’s actually a millionaire banker with a foreign wife. I found the second sketch below on the SlatUKIP page. It shows the Purple Duce again as an actor, though this time he’s a vaudeville comedian singing a song about how he’s really an ordinary British bloke. All the while, his alter ego is reminding him that he’s actually a millionaire, with a very expensive education, a German wife, and far from being British, he’s actually French Huguenot in ancestry. Mike over at Vox Political has just posted this piece, David Cameron betrays 80,000 disabled veterans about the Prime Minister’s plans to strip permanently disabled war veterans of their disability benefit for life. The article notes that DLA at its highest rate is the yardstick local councils use for providing home care for the disabled. When it goes, so does the local authority services. At any given opportunity when in front of TV cameras, David Cameron waxes lyrically about what this nation owes to British Military Forces, with special consideration given to disabled veterans, writes Mo Stewart. But it seems that he means modern disabled veterans who, since 2005, have benefited from the more generous Armed Forces Compensation Scheme. Until April 2005, members of the armed forces who suffered a permanent disablement due to service life were awarded a War Pension, with many awarded access to Disability Living Allowance (DLA), for life, to help to fund the additional costs of disability. Without warning, the Department for Work and Pensions (DWP) has sent letters to working-age War Pensioners advising that access to DLA is about to be stopped and that disabled veterans may, if they wish, apply for the new Personal Independence Payment (PIP) – with no guarantee that it will be awarded. DLA for care at the highest rate is the monitor used by local authorities to provide home care services that permit disabled people to enjoy independent living in the community. Without DLA, or its equivalent replacement, the care services will be removed. The article notes that disabled service personnel over 65 will retain the DLA for life, while modern service personnel have access to the Armed Forces Compensation Scheme and the Armed Forces Independence Payment. However, this still leaves 80,000 ex-service men and women without DLA, and no guarantee that they will get the PIP brought into replace it. Mike’s article considers this a betrayal of our boys and girls in the Forces. He’s right. Cameron and the Tories love posing with military equipment and the army. They have been brought up from public school to see themselves as great war leaders like Alexander the Great, Nelson, the Duke of Wellington and Winston Churchill. Yet they still retain absolute contempt for the men and women, who actually go and fight their wars. They’re grunts, cannon fodder, and their derisory treatment by the Tories has shown this again and again. The Spitting Image book Thatcha! The Real Maggie memoirs contained a mock war comic strip showing a former soldier going mad with a gun after the government showed their gratitude for his service in the Falklands by making him, and others like him, unemployed. After Gulf War I, John Major’s government did it. There was a national scandal of homeless and unemployed war veterans. Now Cameron is doing it again. And all the while posing with them as the protector of Britain and democracy around the world. The Tories’ treatment of ex-servicemen and women bizarrely contrasts badly with that of Iran. The mullahs in charge the Islamic Republic gave former soldiers, who had bought against Iraq in the Iran-Iraq War, preferential treatment in a number of areas. One of these was university entrance. This obviously caused friction with the civilian population, who understandably chafed at the reduced opportunities for them. If a brutal despotism like Iran can reward its servicepeople for the immense sacrifices they made for the homeland, then it more than behoves us to grant our war-wounded proper support and benefits for theirs. Cameron is a disgrace, and his conduct in this shames Britain and our claim to promote democracy and equality.